My phobia was that bad that I would cross the street if I saw someone walking towards me with a dog; any size, it didn’t matter, I was terrified of them all. At the age of 13, I started a paper round (for £1.20 a week!) which was something of a dilemma as some of the houses that I delivered to had dogs. I remember one house in particular, in the Sidcup Road, that had a huge Alsatian. Not only that, but it had a frosted glass panel in the door, and the letter box was right at the bottom. The dog could see me coming and would charge at the front door, barking to high heavens, frightening the life out of me. Another, in West Park, also had an Alsatian (they were a very popular breed in the ‘70s) and occasionally it would be loose at the front of the house. I would either lob the paper in the general direction of the house or shove it down a nearby drain! In 1993 I spent four months visiting relatives in Australia, all of whom had dogs – that was something of a test. I can remember the first night that I spent at my cousin Anne’s house in Sydney. They had a German Short Haired Pointer called Zippy, and on the first night I was too terrified to go to the loo because I thought Zippy would attack me! But over the ensuing days we became friends, and I would even take Zippy for walks. She went everywhere with a small handbag dangling from her mouth and she was as terrified of other dogs as I was! We were a right pair! Fast forward to when I met Debbie at the age of 35; Debbie was a ‘dog person’ and had had a lifelong association with them, having had them as pets both as a child and adult – Boxers were her preferred breed (she’d even shown them at Crufts). She always said that the best way for me to conquer my phobia was to get a dog of my own – I wasn’t exactly enamoured with the idea! 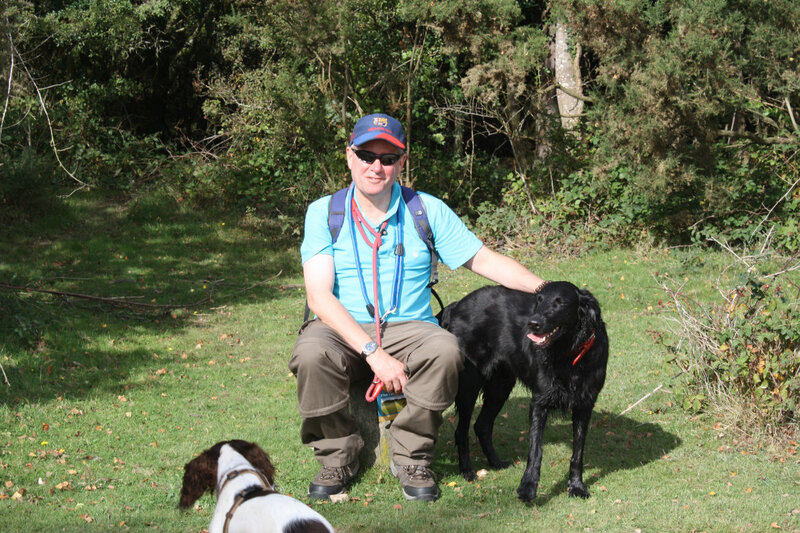 In 2006 I started working with a friend, Jane, who owned a Flat Coated Retriever called Poppy, a breed that I now know to be one of the gentlest and friendliest of any. One morning I arrived at the office and Poppy had had her litter of pups and, sure enough, we ended up with one, which we named Billie. She changed my life. I had no idea that dogs could bring so much joy, on a daily basis. Billie is bonkers, has a massive personality (I never knew dogs had personalities), and loves people and other dogs in equal measure. Her favourite place is our local pub because she knows there will be plenty of people to lick. She has since been joined by our Springer Spaniel, also called Poppy, who spends all day under my desk. I don’t regret not having discovered the joy of dogs earlier in my life, I have more of a ‘better late than never’ attitude. When I was trying to think of a name for my business, Travel Dog PR was in the mix, but I dismissed it, thinking I needed a more generic name without the word ‘travel’ in it. I mentioned this to a friend, Nick (who incidentally owns the fabulous Riad Africa in Marrakech) and he said “no, you have to have Travel Dog, it’s a great name”. I took his advice, and now I love it, and have had countless people say the same thing to me over the last six years (and my logo even features a Flat Coated Retriever). So, for anyone out there who has an irrational fear of dogs, as I had, I would say do whatever it takes to get over it. It will be the best thing that you ever do.